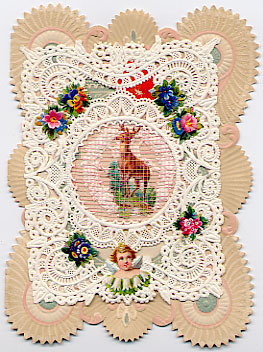 These are greeting cards sent to or from Mount Holyoke women, and also Valentine cards designed by Esther Howland 1847. 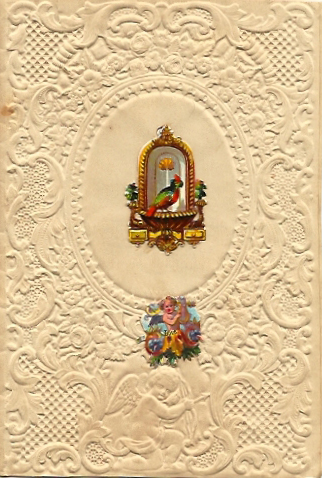 All cards are available with a front scan and an envelope scan, and comments about what is written in the card, either by the user or by the publisher, are included below. envelope Postmarked Dec 22, 1926 9pm in Madison [WI?]. Addressed to Miss Helen Goodner. card "Christmas Greetings" Inside: "Nobody's as welcome / As Santa Claus, I say. / So here he is to wish / for you / A Merry Christmas Day." Signed: "Love Pete"
envelope Postmarked Dec 21, 1926 6:30pm in Clinton NY. Addressed to Miss Helen Goodner. card "Wishing You A Really Jolly Christmas / Clean Bow Day" Inside: "Christmas Greetings / and every good wish / for / your prosperity in the / New Year." Signed: " Evelyn Ferry"
envelope Postmarked Dec 21, 1926 1pm in Boston MA. Addressed to Miss Helen Goodner. Return address for M. E. Edmands in Newtonville MA on the back. card "From a Friend / you're often meeting / Here's a happy, / jolly greeting / Merry Christmas Day" Signed: "Mary Ly"
envelope Postmarked Feb 12, 1927 8:30pm in Washington DC. Addressed to Miss Helen Goodner at Mount Holyoke. card "To My Valentine / Say listen girl - I'm / awful rough / I pull no / Pining / Percy / stuff / No / Weeping Willie / stunt for mine / You Gotta be my / Valentine." Inscription on the back: "I'm feeling kiddish this morning and this is the result. I'm going to the 'Winning of Barbara Worth' this afternoon. They say it's good. Love Pauline"
envelope Postmarked Dec 24  8pm in Holyoke. Addressed to Miss Edith Palmer in South Hadley. The back of the envelope is printed "Christmas Joys be yours Today" and has a 1912 American Red Cross seal on it. card "Oh May This / Christmas / Hold For You / Such Store of Christmas / Bliss / That You May Say / I've Never Known / A Christmas Day / Like This" Inscription inside: "With loving Christmas greetings Cordially yours Delia B Miller"
front A valentine card created by Esther Howland 1847, dating to 1860-1870.
card "We Mount Holyoke girls are quite occupied with our studies, but -"
inside "never too busy to say ..." and then checkboxes for optional greetings. back A Barbara Loveday design. Printed by College Hall Cards, Tuckahoe NY. #25 B203 N.
envelope Original embossed envelope, addressed but postally unused. front A beautiful lace and gilt valentine from the 1870's imprinted on the front by the lace maker Mullord, and marked on the back with a red H, for Esther Howland 1847. Card opens to a pasted on verse, and the back is blank, except for the Howland mark. Measurement is 4 1/4" x 6 1/8", and condition is near excellent -a light glue stain on right side of lace, and the interior has remnants of gilt dresdens. envelope Original embossed envelope, postmarked Feb 25 in Whitinsville, Mass. A dealer has added "1876" in pencil to the front of the envelope. front A beautiful lace and gilt valentine from the 1870's imprinted on the front fold edge by the lace maker Wood, and marked on the back with a red H, for Esther Howland 1847, complete with original embossed envelope. Card opens to a pasted on verse, and the back is blank, except for the Howland mark. Measurement is 3 3/8" x 4 7/8", and condition is near excellent -some toning on the orange underlay paper from the gilt on the paper lace. 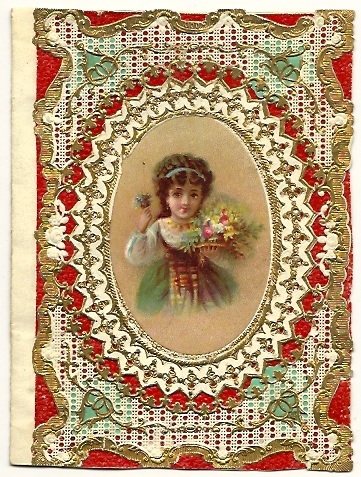 front Lovely gilted paper lace valentine with applied die cut cupid in floral wreath, and applied blue silk ribbon, imprinted NEV 35 for New England Valentine Company on back of card (established by Esther Howland 1847), and dating from the late 1870's. Interior has printed verse, no signature. Measurement is 4" x 6" and condition is excellent, no flaws. 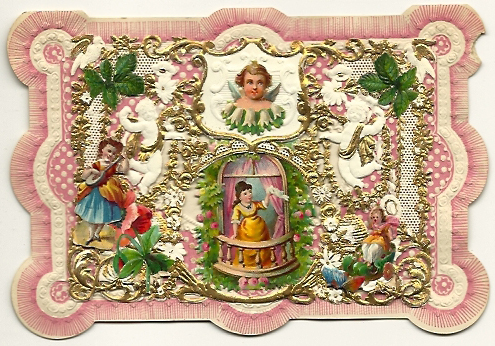 front This 1850s Valentine is 2-3/4 inches by 4-1/4 inches and has a beautiful paper lace front with cameo-style openings and embossed cupids or angels inside the cameos, backed by large green and fuchsia paper wafers behind them, setting off the cupids. There are also small green and fuchsia hearts cut out of the same type paper. The lace also has many embossed flowers in it. 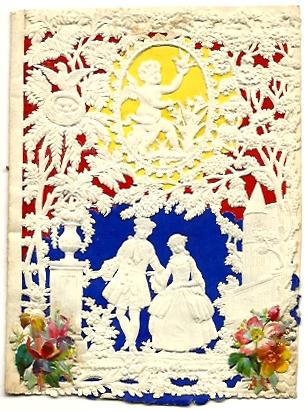 There are two embossed chromolithograph Victorian scraps of a boy and a cupid holding a flag with "A Token of Love" written on it. There is a verse on the inside that was hand cut and glued on. There is a capitol H in Red on the back with the number 10, which was Esther Howland's signature stamp. The very bottom of the paper lace looks a bit rough; otherwise it is in excellent condition. 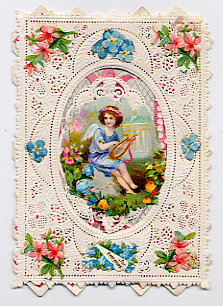 front This 1870s Valentine is a 4 3/4" x 3 1/2" embossed die-cut valentine with a hinged lace paper layer with a mesh netting on the center opening and applied embossed scrap ornaments. There is a scrap of a deer (stag) showing through the netting. There is an applied verse on the inside page reading REMEMBER thy Creator now, In these thy Youthful days.. The back is embossed "N.E.V. Co. 10". The name was used by Esther Howland of Worcester Mass for her company formed in 1870. Condition: overall excellent. Has not been written on. Crisp and clean. front This is a 4 3/4" x 3 1/2" single fold embossed die-cut valentine. 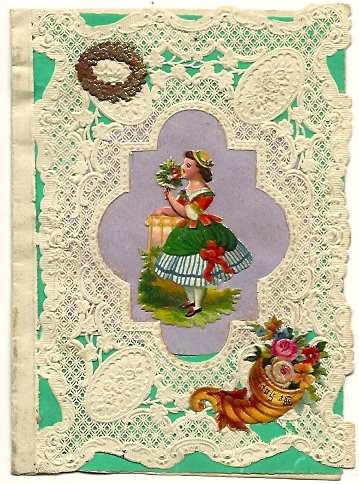 It has a hinged intricate lace paper decoration with mesh fabric in the center. There is a small boy with a toy train and dog, perhaps a terrier. 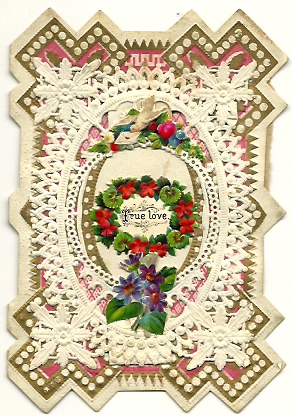 Lace paper embellished with tiny applied scraps. The inside page has an applied verse. 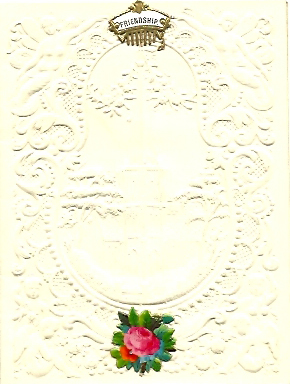 The back of the valentine is embossed with the mark "N.E.V. Co. 10". This was the New England Valentine Company, formed by Esther Howland in the 1870s when she reorganized her business. Condition: the back is marked in pencil - John Noble - Gift of Kit Robbins. Has not been inscribed. Scrap book residue on back. Overall excellent. 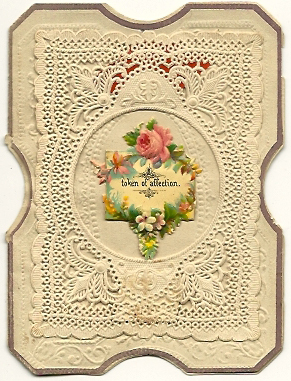 front This is a single fold 4" x 2 7/8" embossed die-cut 1870s valentine. Topped with a hinged finely detailed lace paper with oval center opening. It is embellished with silver and decorated with tiny applied scraps - one of a hand on a book. A scrap of holly with red berries marked Sincerity shows through the oval. The inside page has a printed verse The back of the valentine is embossed with the mark "N.E.V. Co. 5". This was the New England Valentine Company, formed by Esther Howland in the 1870s when she reorganized her business. Condition: overall excellent. Some scrapbook glue marks on back. Has not been inscribed. 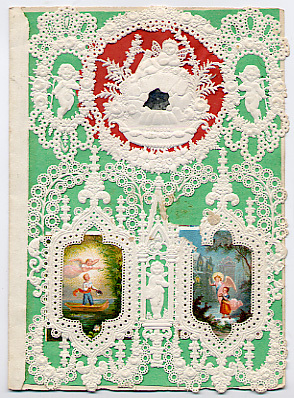 front Fancy lace marked "Windsor" over green background, mirror over red paper wafer, two paper scraps with angels and children. Inside little paper scrap poem. On the back stamped in red "H over 25" and written "A.E.B.". This card measures approximately 5 1/2" x 3 3/4". This card is in good to very good condition. On the front there is an area of lace missing. front This is a beautiful little card of lace on paper springs with 3 mini scraps of angels and flowers and a scrap of a gilded star over another flower scrap in the center of the embossed folding card of blue and white. There is a stamped poem on the inside, "My love unchanging Still will be, Though friends depart and fortune flee." On the back is the NEV.CO. over a "5". There is some pencil writing on the back "NEVCO and E. Howland". This card measures 4" x 2 3/4". front Measuring 4 x 5 1/2 inches, this one fold Valentine- blank inside- has die-cut embossed paper which is unmarked, but on the back of the card is the stamped "H25" in the extreme upper left corner indicating it is a Howland Valentine. Unfortunately, some paper along the top right hand edge has been lost (seen in scanned photo). 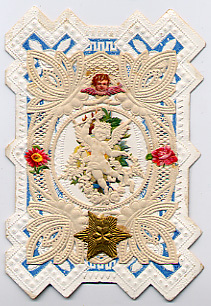 However, the cherub holding a heart in the center oval has survived in excellent condition as have the Victorian scraps. The above reads "Weddings now are all the go, Will you marry me or no".The banner at the bottom reads "Happiness." The back has two 5/8 inch tears on the mid left hand edge. front Measuring 2.75 x 3.5 inches, this one fold Valentine opens to a small 4-line verse. The back has the embossed New England Valentine Co. logo. front Measuring 3 11/16" x 5 5/16" inches, this one fold Valentine has three small scraps, one that says "Forget me not", on the front, and opens to a small 4-line verse. The back has the Howland "H" mark and a price of 25 cents. front Measuring 2 12/16" x 3 11/16" inches, this one fold Valentine has one small scrap on the front, and opens to a small 4-line verse. The back has the Howland "H" mark and a price of 10 cents. front Measuring 2 11/16" x 4 15/16" inches, this one fold Valentine has one small scrap on the front, and opens to a small 4-line verse printed in blue inside. Inscription inside: "From Auntie B. 1881." On the back is the NEV.CO. over a "5". Glue marks from being pasted in a scrapbook in the past. front Measuring 5" x 3 1/4" inches, the gold overlay is mounted on paper springs with mini scraps. The verse inside is printed in blue upside down. On the back is the NEV.CO. over a "10". Unused. front Measuring 2 11/16" x 3 10/16" inches, the lace is mounted on paper springs with an orange paper showing underneath. "A token of affection." The card opens to a 4-line red verse pasted inside. Inscription: "From Frank F. Witham" On the back is the NEV.CO. over a "5". Rips on reverse from being pasted in a scrapbook. front Measuring 2 6/16" x 4 10/16" inches, the lace is displayed over green paper with a verse on hope pasted on it. The cornucopia scrap on the front reads "Be Happy." The back shows Howland's red H hallmark, with 1 1/2 underneath. front Measuring 2 14/16" x 3 14/16" inches, the lace is displayed over red paper with smaller pieces of yellow and blue pasted in to show through the lace. Opens to a 4-line verse pasted inside, and "1877" penciled underneath. 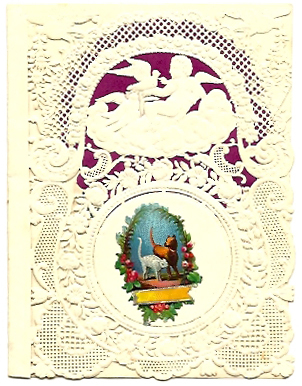 The back shows Howland's red H hallmark, with 5 underneath, pasted in the top left corner. 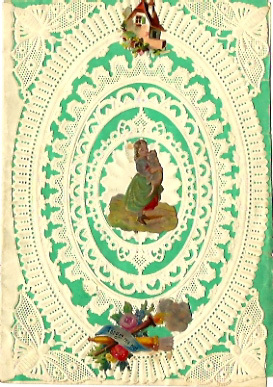 front Measuring 3 6/16" x 4 9/16" inches, the lace is displayed over red paper with the center medallion of a girl holding flowers pasted on the red paper. 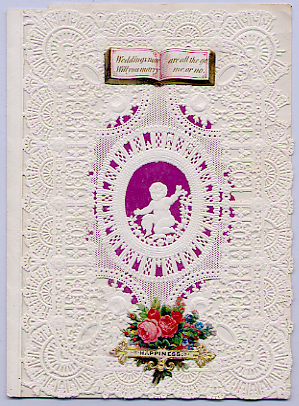 Opening the lace and the red paper layers reveals a 4-line verse pasted inside. The back shows Howland's red H hallmark, with 25 underneath, stamped in the top left corner. front Measuring 3 5/16" x 5 14/16" inches, the lace is displayed over a plain white paper with no verse or inscription. 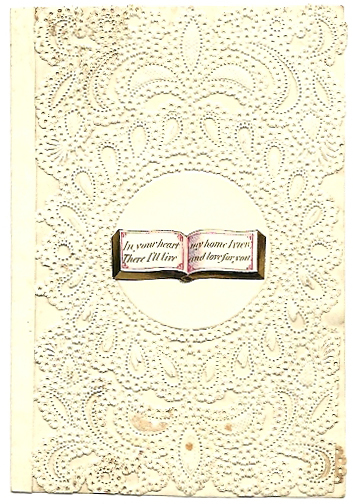 The verse on the front reads "In your heart / my home I view / There I'll live / and love for you." The back shows Howland's red H hallmark, with 15 underneath, stamped in the top left corner. 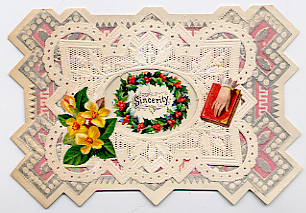 front Measuring 3 3/16" x 4 3/4" inches, the card is made of embossed paper and pasted Victorian scrap. The verse on the inside reads "No rubies on the Indian shore / Outshine thy noble mind; / Its radiance far excels them all, / And blesses human kind." The back shows Howland's red H hallmark, with 10 underneath, stamped in the top left corner. 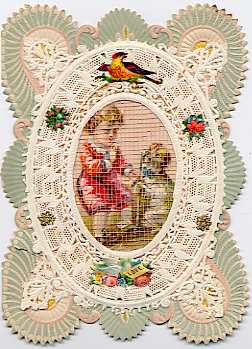 Pencil inscription on the back: "Mama"
front Measuring 2 7/8" x 3 13/16" inches, the card is made of embossed paper and pasted Victorian scrap. The front shows a church steeple surrounded by trees and an elaborate border with cherubs and angels, with a pasted scrap that reads "Friendship" and a pasted scrap of a red rose. The verse on the inside reads "Sweetest, fairest, loveliest, dearest, / Each of these art thou to me, / Fondest, truest, and sincerest - / These I'll ever be to thee." The back shows Howland's red H hallmark, with 3 underneath, stamped in the top left corner.